Does Your Association Need an AMC? Association Management Companies (AMCs) specialize in managing associations and not-for-profit organizations, providing leadership and professional management services through experienced staff, best practices and shared resources. 10. 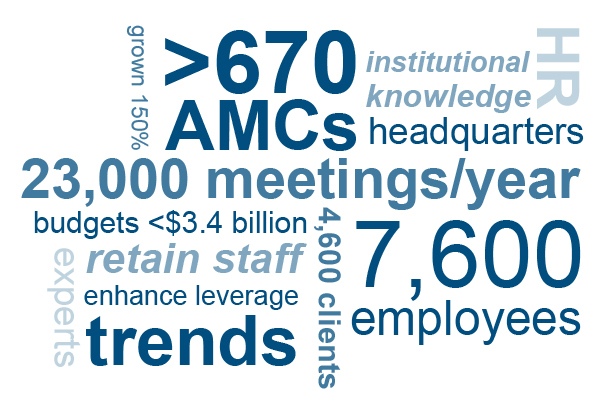 AMCs serve as headquarters-staff, files and history all live in one place. 9. Free your Board to focus on strategic direction, rather than tactical issues. 8. Remain in the know with a strong base of institutional knowledge. 7. Stop losing sleep over liability issues. 6. Tap experts and skilled specialists in a variety of functional areas. 5. Access the latest technological advances, without all the associated costs. 4. Retain skilled staff members that align with your organization's needs. 3. Stay on top of the latest trends in the association industry. 2. Enjoy Enhanced leverage with outside vendors and increased buying power. 1. Say goodbye to HR headaches for good. of Good Practices for the AMC Industry. of expertise and resources to not-for-profit leaders.